DAVE'S PRESENTS 1948 TOPPS MAGIC CARDS! 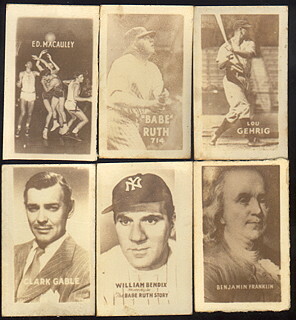 1948 Topps Magic Photos set contains 252 small individual cards featuring sport and non-sport subjects. They are approximately 7/8" X 1 7/16". They were issued in 19 lettered series with cards numbered within each series. The fronts were developed much like a photograph from a blank appearance by using moisture and sunlight. Due to varying degrees of photographic sensitivity, the clarity of these cards ranges greatly. The catalogue designation for these is R714-27, and contains the first baseball cards issued by topps. We received all of the set except for the Dogs G1- G17, the general sports H series, and the western S series.